What: Film screening of a documentary about the Attica prison riots and $5-10 suggested donation multi-course dinner (NOTAFLOF)! The food will be vegan, let us know if there are other dietary restrictions. September 9, 1971: two weeks after the killing of George Jackson at San Quentin State Prison (in California), about 1,000 of the Attica (NY) prison’s approximately 2,200 inmates rioted and seized control of the prison, taking 42 staff hostage. During the following four days of negotiations, authorities agreed to 28 of the prisoners’ demands, such as better medical treatment, fair visitation rights, and an end to physical brutality, but would not agree to demands for complete amnesty from criminal prosecution for the prison takeover. Eventually, state police took back control of the prison. When the uprising was over, at least 43 people were dead, including ten correctional officers and civilian employees, and 33 inmates. September 9, 2016: Prisoners across the United States will begin a work-stoppage to shut down prisons all across the country. From their callout: “We will not only demand the end to prison slavery, we will end it ourselves by ceasing to be slaves.” Prisoners in the United States are forced to work in privatized prisons for pennies per hour, if anything at all, effectively continuing the racialized slavery that was supposedly abolished after the Civil War. Because those who are organizing for the strike on the inside are already beginning to face repercussions for their actions, and are likely to face more, outside support and amplification of these struggles is critical at this moment. Extra info: Just a heads up that over 40 people died in the course of this uprising and the film is likely to be intense and include television footage from the time. Feel free to set up support systems for yourself if needed, the organizers of this event will not be able to offer much in the way of support since this is being organized last minute by few people. This film will be in english, most likely without french subtitles, unless we can find them in time. There will be whisper translation available. Accessibility info about the venue: Le Deferle is an anarchist social space located in Hochelaga. It is on the first floor of the building, but there is one step up into the space. There is a gender neutral bathroom on site that is not wheelchair accessible. Quoi: Projection d’un film-documentaire sur les émeutes de la prison d’Attica. Don suggéré de 5-10$! La nourriture sera vegan, laissez-nous savoir si vous avez d’autres restrictions alimentaires. Le 9 septembre 1971: deux semaines après l’assassinat de George Jackson à la prison d’État de San Quentin (en Californie), environ 1000 des 2200 détenus de la prison d’Attica (NY) se sont révoltés et ont pris le contrôle de la prison, en prenant 42 employés en otage. Pendant les quatre jours de négociations suivants, les autorités ont accepté 28 des demandes faites par les prisonniers, comme par exemple de meilleurs traitements médicaux, plus de droits de visite et la fin de la brutalité physique, mais la demande d’amnistie complète des poursuites pénales pour avoir pris le contrôle de la prison n’a pas été accordée. Finalement, la police de l’État a repris le contrôle de la prison. Lorsque le soulèvement fut terminée, au moins 43 personnes étaient mortes, dont dix gardiens et employés civils, et 33 détenus. Le 9 septembre 2016: des prisonnier.es à travers les Etats-Unis débuteront un arrêt de travail pour faire fermer les prisons dans tout le pays. D’après leur appel: « Nous n’allons pas seulement exiger la fin de l’esclavage carcéral, nous allons cesser d’être nous-mêmes des esclaves.» Les prisonnier.es aux Etats-Unis sont contraint.es de travailler dans les prisons privatisées pour quelques sous l’heure, voire rien du tout, l’esclavage racialisée qui aurait supposément été abolie après la guerre civile se poursuit. Parce que celleux qui organisent la grève à l’intérieur font déja face aux répercussions de leurs actions, et qu’ielles sont susceptibles d’en subir d’avantage, le soutien depuis l’extérieur et l’amplification de ces luttes est nécessaire en ce moment. Informations supplémentaires: Attention, plus de 40 personnes sont mortes au cours de ce soulèvement. Le film est susceptible d’être intense et de comporter des images-télé de ce temps-là. Sentez-vous libre de mettre en place vos systèmes de soutien pour vous-même, si nécessaire, les organisateur.trices de cet événement ne seront pas en mesure d’offrir beaucoup en la matière, vu que l’évènement est organisé à la dernière minute par quelques personnes. Ce film sera en anglais, probablement, sans sous-titres français, à moins que nous les trouvions à temps. Une traduction chuchotée sera disponible. Accessibilité du lieu: Le Deferle est un espace social anarchiste situé dans Hochelaga. Il est au rez-de-chaussé, mais il y a une marche pour entrer. Il y a une toilette dans l’espace, pour genre confondu, n’étant pas accessible aux fauteuils roulants. A Challenge: Spread the Strike to Every Jail, Juvie, and Prison, in ‘so-called’ Canada too! 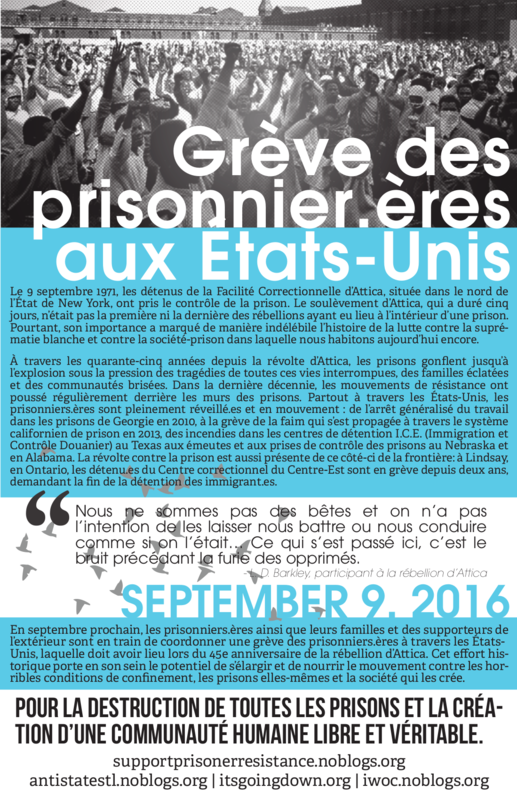 This is a challenge to anyone who is supportive of the September 9th prisoners’ strike but who has remained on the sidelines until now. In order for this strike to not be snuffed out by a handful of prison censors and violent guards, it needs to spread uncontrollably beyond their reach. And because prisons strictly forbid communication between prisoners, it is our responsibility on the outside to facilitate this contagion. Spreading the call to prisons in Canada will further this contagion, and give an opportunity to link our struggle against prison and the world that needs it, through prison walls and across borders. The first obvious step is to begin sending in word of the strike, immediately. If people on the inside are to be able to meaningfully act, they are going to need some time to begin spreading the word to their friends and formulating a plan. To that end, we are suggesting that outside accomplices begin printing the strike announcements (below) and mailing them inside en masse. Mail to whom you ask? To anyone! To your old high school friend stuck in county jail, your friend’s little sister in juvie, to Black Liberation prisoners who have inspired you, your neighbor’s relative in an immigrant detention center, or to that person on the local news who robbed four (!) banks before she finally got caught last year. If you’re not able to provide ongoing support to the people you mail or if you give a fake return address, please be clear about that in your letter. People on the inside need to know if people on the outside will have their backs or not. If you do maintain communication with people you contact, however, be opaque and creative in the ways that you talk about these things. Use different return addresses to confuse prison censors, or find clever new ways to get information inside without it being attached to your legal name. And don’t forget to act as a signal booster for their actions; for instance, if the strike has taken hold, and/or the prison is retaliating against them, post that info to sites like lasolide.info, itsgoingdown.org or supportprisonerresistance.noblogs.org so that people can organize call-in’s or other solidarity actions to target the prison administration. There’s no denying that this is a historical moment, a rare opportunity that simply cannot missed. There are no sidelines in a world without leaders. Everyone has a role to play so let’s get going! On september 9, things are heating up in the prisons! The letter that follows was written by inmates of American prisons involved with the IWOC (Incarcerated Workers Organising Commitee). They wrote it to inform you of a massive struggle that will rock many American prisons this September 9th. There will be a coordinated prison strike, with the goal of putting an end to prison slavery. In the US, private businesses have inmates work in federal and state prisons, in exchange for abysmal salaries. The use of their work force is an integral part of the economy of the country. All this in a context of institutionalized racism where the majority of inmates are black and latino; where slavery never ended. In Canada, imprisonment is no less unbearable; society itself produces the crimes of those it imprisons, especially by keeping them in precarious living conditions. By no accident, the majority of people who find themselves in prison are there for these “crimes” caused by the absence of possibility offered by this society to those who its marginalizes. Colonial violence and white supremacy are perpetuated here as well: indigenous and racialized people, in particular the women in these communities, are massively overrepresented in Canadian prisons. Although the act of working can help to pass the time and is perceived as a privilege, businesses (like CORCAN) exploit prisoners in exchange for ridiculous salaries. These businesses profit from the vulnerability of inmates who are still considered sub-humans, and exploit their labour and their time. For instance, diverse struggles have taken place in the last years against prisons in Canada. At this moment, around sixty detainees are on hunger strike at the immigrant detention centre in Lindsay, Ontario, to demand a maximum time limit to detention without charge for people who don’t have status. As well, in 2015 and 2016 there were two hunger strikes in the maximum correctional centre in Regina, Saskatchewan to demand more hours of yard time, and in 2013, there was a strike against the salary cuts in federal prisons. Organizing in prison is never easy, and yet here are concrete examples. Ceci est un moment historique, une rare opportunité que l’on ne doit pas manquer. On ne peut obtenir un monde libre en restant les bras croisés. Chacun.e a un rôle à jouer.Allons-y! Le 9 septembre, ça bouge dans les prisons! Le 9 septembre 1971, les détenus de la Facilité Correctionnelle d’Attica, située dans le nord de l’État de New York, ont pris le contrôle de la prison. Le soulèvement d’Attica, qui a duré cinq jours, n’était pas la première ni la dernière des rébellions ayant eu lieu à l’intérieur d’une prison. Pourtant, son importance a marqué de manière indélébile l’histoire de la lutte contre la suprématie blanche et contre la société-prison dans laquelle nous habitons aujourd’hui encore. À travers les quarante-cinq années depuis la révolte d’Attica, les prisons gonflent jusqu’à l’explosion sous la pression des tragédies de toutes ces vies interrompues, des familles éclatées et des communautés brisées. Dans la dernière décennie, les mouvements de résistance ont poussé régulièrement derrière les murs des prisons. Partout à travers les États-Unis, les prisonniers.ères sont pleinement réveillé.es et en mouvement : de l’arrêt généralisé du travail dans les prisons de Georgie en 2010, à la grève de la faim qui s’est propagée à travers le système californien de prison en 2013, des incendies dans les centres de détention I.C.E. (Immigration et Contrôle Douanier) au Texas aux émeutes et aux prises de contrôle des prisons au Nebraska et en Alabama. La révolte contre la prison est aussi présente de ce côté-ci de la frontière: à Lindsay, en Ontario, les détenu.es du Centre correctionnel du Centre-Est sont en grève depuis deux ans, demandant la fin de la détention des immigrant.es. En septembre prochain, les prisonniers.ères ainsi que leurs familles et des supporteurs de l’extérieur sont en train de coordonner une grève des prisonniers.ères à travers les États-Unis, laquelle doit avoir lieu lors du 45e anniversaire de la rébellion d’Attica. Cet effort historique porte en son sein le potentiel de s’élargir et de nourrir le mouvement contre les horribles conditions de confinement, les prisons elles-mêmes et la société qui les crée. Pour la destruction de toutes les prisons et la création d’une communauté humaine libre et véritable. In the forty-five years since Attica, prisons have swelled to bursting with the tragedies of disrupted lives, fractured families, and broken communities. In the last decade, resistance movements have steadily grown behind the prison walls. From the statewide work stoppage in Georgia prisons of 2010 to the hunger strike that spread throughout the California prison system in 2013; from fires lit in I.C.E. detention centers in Texas to riots and prison takeovers in Nebraska and Alabama, prisoners across the US are wide awake and on the move. Revolt against prisons is also present on this side of the border; in Lindsay, Ontario, detainees held by CBSA in the Central East Correctional Centre have been on strike for two years demanding an end to immigration detention. 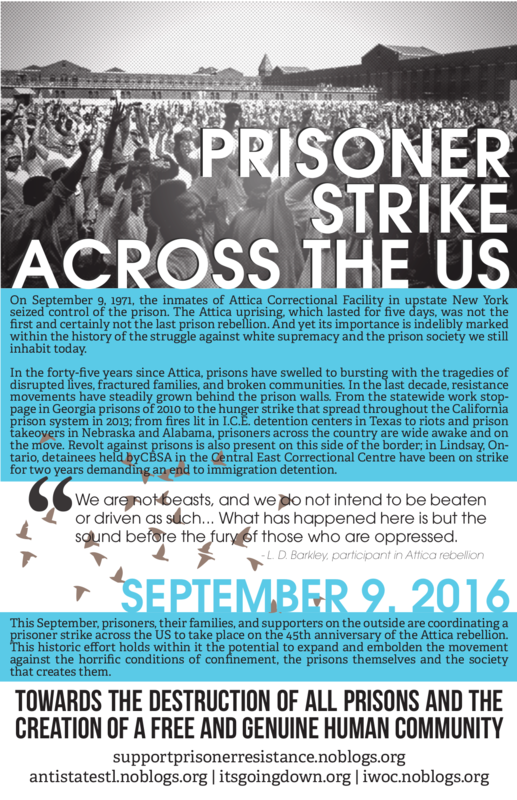 This September, prisoners, their families, and supporters on the outside are coordinating a prisoner strike across the US to take place on the 45th anniversary of the Attica rebellion. This historic effort holds within it the potential to expand and embolden the movement against the horrific conditions of confinement, the prisons themselves and the society that creates them.